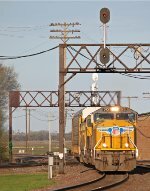 Description: UP 3804 leads UP 5036 on Q20418 through Owensboro. Description: NS 172 stopped at North Kannapolis with a UP SD70M, a NS GP40-2, a NS SD40-2, and a NS SD40. Description: Q549 passes through Cordele with a pair of UP's leading 2 dead CSX motors. Description: Southbound Q549 leaves Fitzgerald for the last leg toward Waycross. Description: UP 3804 west rolling over the Blair Bridge. Description: a southbound lead by 3 UP units. Description: NS train 44A EB. Description: Another break from coal traffic.